Yes, The Matrix Online sucked. Its gameplay was an abhorrent pile of repetitive garbage that offered no real direction other than doing storyline-less missions until you hit 50, in which there was no endgame. The combat was interesting, as it offered scripted camera shots for insane kung-fu flips and hits, but it wasn't enough to "save" the game. I hear you. But if you think the above paragraph is all The Matrix Online had to offer, then you are sadly mistaken. You missed out on storyline events, PvPvE, amazing roleplayers, writers, and graphic artists. You missed out on philosophy, politics, memorable characters, and puzzles. You actually missed out on the bulk of what The Matrix Online had to offer, all of which makes the game's passing more painful. MxO wasn't World of Warcraft, and it certainly had enough dark spots in the game design. But the game and its developers brought a very different style of play to the MMO scene -- one that should be commemorated with a few looks back on some of the best events the game had to offer. Who needs raids when you have Morpheus being insane? One of the very first things MxO had to offer the players was the ability to directly communicate with storyline characters. As the game opened its doors to players, one arm of the development team was specifically dedicated to writing up and acting out events in the Matrix. The Live Events Team (dubbed the LET) was able to take control of main characters to perform live speeches, meet with factions (guilds) regarding the state of the Matrix, and provide clues and insight into some of the game's mysteries. Characters provided players with reasons to work hand in hand with the story. The appearances of Morpheus lead to many Zion factions declaring him as their leader, disregarding the "orders" of Commander Lock. At the outset of the game, Morpheus was still furious with the Machines as they did not return Neo's remains to Zion. With his options running out and after meeting with The Oracle, Morpheus turned to more destructive means to get his point across -- code bombs. The event was simple -- Morpheus (as controlled by a developer) ran about the city dropping bombs on key locations. The bombs were guarded by NPC spawns which dropped pages of a disarming manual upon their deaths. Players were expected to kill the spawns and disarm the bombs, as these bombs would cause bluepills to see the "true reality of the Matrix" and cause them to go insane or die of shock. The three organizations of the Matrix began to work hand in hand as Merovingian and Machine forces worked to disarm the code bombs. Players took on the Matrix's problems as their own and worked to make sure Morpheus didn't get his way. Zion, however, was a completely different story. Zionist players were split by philosophies, as the factions who declared loyalty to Morpheus refused to disarm the bombs, even creating "disruption parties" to sit directly over bombs. If enough players sat atop a bomb, it would make it impossible for anyone else to target the bomb to disarm it, thus leading to a number of code bombs going off. Forum arguments broke out, players began declaring allegiances and forming treaties with one another, and philosophies of "acceptable losses" were brought into question. Most MMOs had never brought these types of questions up, as the game began to move beyond "simply leveling and seeing content" for most players. The Matrix had us. 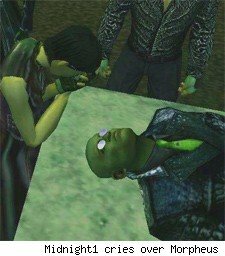 In time, the community was struck with a hard blow -- the loss of Morpheus. In a very epic and unexpected cutscene, Morpheus was killed by a new character known as the Assassin. The porcelain masked mockery shot Morpheus in cold blood by appearing from a very small vent in an alleyway where Morpheus was running away. The Assassin had quickly made the top of "The Community's Most Wanted" as everyone wanted information leading to the location of the Assassin. It was up to the community to deal with him, and deal with him they did. Time passed, Morpheus's funeral was held, and many players attended. It was here when Morpheus's body decomposed into a churning mass of flies in front of players, turning into the very communicable "fly virus." The Assassin was getting bolder, but other players found out that it was the Merovingian who had hired and brought the Assassin into the Matrix. The Merovingian had his own problems, however, as lupine and vampire programs broke out of his prison construct, leading to a mini-event relating to their vendetta against the Frenchman.